Wouldn't you love to know what stresses or aggravates your dog or cat? I know I would. While we can't exactly what our pets are thinking, we can ease their stress and anxiety with helpful products like the Anxiety Wrap. The Anxiety Wrap is a patented body-hugging wrap that gently calms and soothes your pet by applying just enough pressure to their body to help them feel secure. 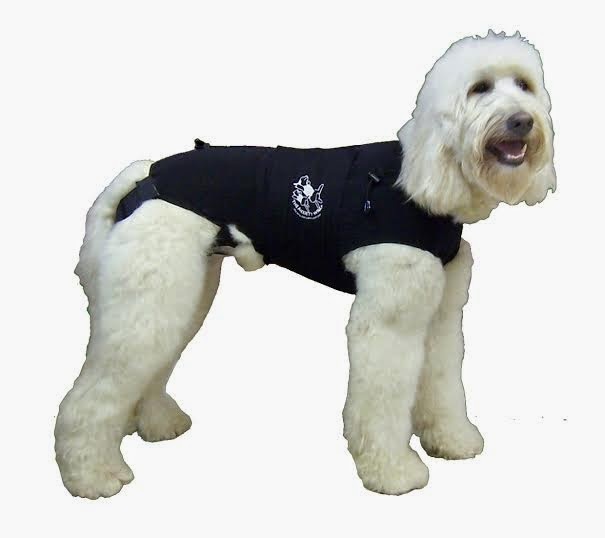 Unlike other wraps, the Anxiety Wrap also attaches to the hind legs to ensure the entire length of the body is wrapped, not just around the chest. This wrap is perfect for situations where your dog may be exposed to fireworks, thunderstorms, crowds, or being left along (i.e. separation anxiety). This wrap claims to even help with excessive problematic barking. We received an Anxiety Wrap for Venus to see if it would help calm her down when she became irritated by loud noises and being able to hear our neighbors (both next door, as well as neighborhood children playing outside). We ordered a size Mini-Plus, for dogs 17-20 pounds and 19-20 inches long. Venus weighs 18 pounds, and this wrap was very snug on her. I don't know if they run small, or if they are supposed to be super tight, but that is the first thing I noticed when I was trying to get it on her. The material was very smooth, and sleek. It wasn't thick, and therefore didn't add any addition heat like thicker wraps, and once we got it on it was easy to adjust. As far as barking goes, the Anxiety Wrap did ease Venus' anxiety when she could hear people talking, but once she was able to see people outside she still ran to the window barking frantically. While this wrap did help, I would not consider it a miracle. Perhaps it would work better for simply calming dogs who suffer from fear of thunderstorms or loud noises. I will however continue to use the wrap, especially when we have to leave the girls at home, to make sure she is content until our return. You can find more information about, as well as purchase, the Anxiety Wrap on their website. Be sure to visit Anxiety Wrap on Facebook - Twitter & YouTube.